The UQU Vice President for Postgraduate Studies and Scientific Research, Dr. Thamir Al-Harbi, has specified the following 7 areas as eligible for the excellence allowance that will be granted to academic staff members of different academic ranks, and the like: scientific publication; national, regional, and international academic awards; patents; discovery of medications; medical, biotechnical, or scientific discoveries; and performing rare surgeries. This announcement was made after His Excellency the UQU President, Prof. Abdullah Bafail, launched an e-portal today to receive applications for the excellence allowance. This took place in the presence of the Vice President for Postgraduate Studies and Scientific Research, Dr. Thamir Al-Harbi; the Dean of Information Technology, Dr. Fahd Al-Dusari; and the Vice Dean of Information Technology for e-Transactions, Dr. Atef Al-Hajaili. His Excellency indicated that the excellence allowances were approved in order to express appreciation to the academic staff members, and to encourage outstanding researchers to improve their output. His Excellency indicated that scientific research is integral to the academic process, and has great importance in disseminating the culture of knowledge and patents. His Excellency urged the researchers from among the academic staff to submit positive scientific research in line with the UQU strategic foundations, the National Transformation Program 2020, and Saudi Vision 2030. 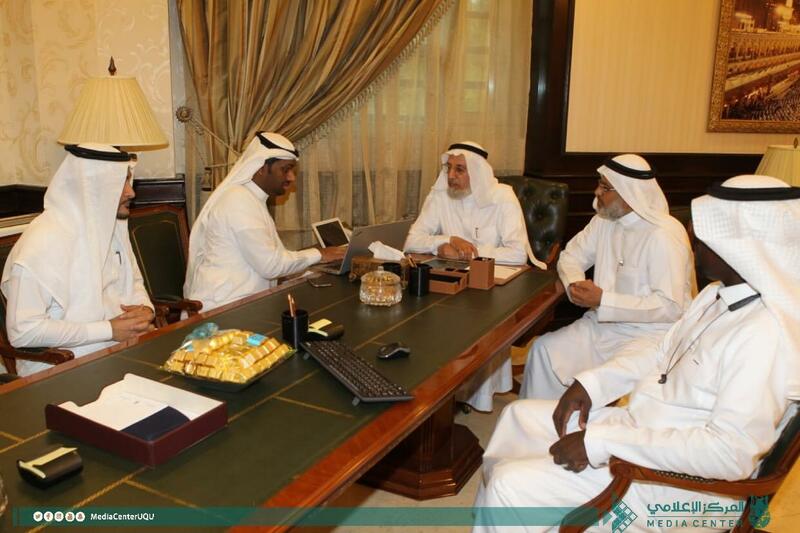 Dr. Al-Harbi emphasized that the allowances are among the objectives of the Academic Council and are designed to achieve fairness and equality among academic staff members and the like, support the university with outstanding academic staff, and encourage scientific research, authorship, publication, and translation. These objectives also include ensuring accuracy and outstanding performance, disseminating a culture of discipline and awareness of bylaws and regulations, and developing the executive and procedural rules, which contribute to promoting scientific research. Dr. Atef Al-Hajaili clarified that the e-portal designated for the excellence allowance includes e-forms for applying for the awards. These forms enable the academic staff members to upload their application and follow the process through all stages of the application.